Utilising Aquafine’s UV Aquaculture systems we can demonstrate unparalleled performance from over 20 years experience in this highly specialised ultra violet water filtration process. Committed to providing superior quality and the latest advancements in UV technology, low cost of ownership comes as standard, as all our water treatment equipment is virtually maintenance free and has low energy consumption. 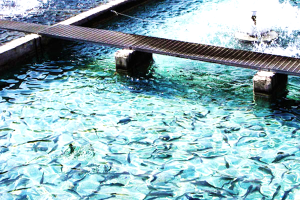 Today’s aquaculture industry can use vast quantities of water to incubate fish eggs and rear juvenile fish. However it’s purity continues to decline while disease concerns increase. This phenomenon is due in part to the increased demand for water from growing urban areas, continued pollution of our natural waters and the introduction of new, pathogenic micro-organisms to natural waters, through a variety of routes: bird, animal and human activities, including ship ballast water discharge. The health benefits attributed to Omega-3 has led to increased demand, which means higher stock densities in the same hatchery footprint. This brings many challenges to the industry, but there are solutions available today which can help to overcome them. This is leading more fish hatcheries to install sophisticated water treatment equipment to enhance water quality, decrease usage by re-circulating water, reduce the possibility of disease outbreaks due to pathogens and balance water needs, due to the lack of available water from natural sources. Ultra Violet water filter systems play an important role in a complete water filtration process in aquaculture facilities. Ultra Violet water filter systems are available in both closed pipe and open channel arrangements to provide the greatest flexibility to the hatchery. Diseases that can be treated with a UV water filtration process include Infectious Pancreatic Necrosis (IPN), Vibrio, White Spot, Saprolegnia, Infectious Salmon Anaemia, Protoza and Viral Haemorrhagic Septicaemia. With Aquaculture UV water treatment equipment unparalleled in performance, KK Water & Aquafine are committed to providing superior quality and the latest advancements in Ultra Violet water filter technology.